The Active Asset Allocator investment strategy is designed to deliver a consistent level of positive returns over time with a strong focus on capital preservation. We follow a multi-asset investment approach, actively allocating between global equities, bonds, precious metals, currencies and cash. We always invest with the primary trend of the market and do not follow a benchmark. Instead, we manage the market risk for our clients. Our strategy has returned +11% per annum net of fees since inception with a lower level of risk than the average multi-asset fund. Our active asset allocation approach is best illustrated in the following chart. Global stock markets are under increasing pressure. The S&P 500 has fallen -8% in the first three weeks of 2016, while technology stocks are -10% and small cap stocks -11% YTD. The internal structure of the market has also deteriorated with the number of stocks on the NYSE making new lows increasing significantly in recent weeks. In contrast, the Euro, bonds and gold have acted better and are showing positive returns YTD. Together, these account for 80% of the Active Asset Allocator, which has started 2016 +6% ahead of benchmark. Government bonds continue to attract safe haven capital flows as stock market volatility persists. I expect gold to also step up as a safe haven asset in 2016 and outline a few more bullish developments this month for the metal, including a +27% increase in investment demand in the third quarter of 2015 and a +62% year/year increase in US consumer demand as recently reported by the World Gold Council. 2016 is off to a difficult start for investors. The S&P 500 has delivered its worst January month-to-date performance since its inception in 1923. The S&P 500, NYSE Composite and Dow Jones Industrial Average have all declined -8% in the first 10 trading days of 2016. Global equities in euro terms are -9% YTD. US Transportation (-11%), Technology (-10%), and Small Cap stocks (-11%) have fared even worse, increasing the likelihood that a full-scale bear market may now be in force. In contrast, the Euro, bonds and gold have each acted better and are showing positive returns YTD. Together, these positions account for 80% of the Active Asset Allocator. The S&P 500 closed Friday at 1,880, just 13 points above the October 2015 lows. The Index reached an intra-day lower low of 1,857 but stocks rallied into the close to end another difficult week. A lot of technical damage has occurred and it is now all for the bulls to prove. Back in 2008, when the S&P 500 broke decisively below its 50 week moving average (50WMA), stocks sold off sharply but then rallied one final time to test the underside of the 50WMA before the real damage was done. This time around, we have already had one test of the 50WMA from below. We may get another shortly to reset sentiment, which has turned quite bearish in recent weeks (it looks like that this Tuesday morning), or we could just accelerate lower from here. For a rally to occur, the S&P 500 must hold 1,867. If the stock market spends too much time below 1,867, we could be in for trouble. The 50WMA is currently +9% above where the S&P closed on Friday. (US markets are closed on Monday 18th January in observance of Martin Luther King Day). Outside of US large cap stocks, a lot of technical damage has already occurred. The Value Line Index (lower left chart), an equally weighted index of 1,700 US companies, formed a bull market top in April 2015 and has already declined -22%. The Russell 2000 Index (lower right chart) of US small cap stocks topped out two months later in June 2015 and has also fallen -22% in the intervening period. The Dow Jones Transportation Average (DJTA), the oldest running stock index in the US (created in 1884 by Charles Dow), comprises 20 stocks in the transportation sector and is an excellent barometer of the health of the US economy. The DJTA has now fallen -28% since topping out in November 2014. The declining transport stocks and collapsing price of crude oil are discounting much weaker trading conditions in the US in the months/years ahead. In my October 2015 Investor Letter, I noted that the number of stocks making new highs minus those making new lows had turned positive for the first time in many months and a consistent positive trend would allow me to become more constructive on the stock market. However, I needed to see more data before making that call. Over the following three months, the internal structure of the market deteriorated and the number of stocks on the NYSE making new lows increased significantly. I need to see new highs outpacing new lows before I can turn bullish on equities. In the meantime, I continue to recommend a defensive position in the Active Asset Allocator. For more information on my stock market analysis, please get in touch. You can reach me at brian.delaney@secureinvest.ie or 086 821 5911. Government bonds continue to attract safe haven capital flows as stock market volatility persists. German 10-year bund yields have fallen -10 bps in 2016 YTD and have almost halved since peaking in June 2015 at 0.98%. 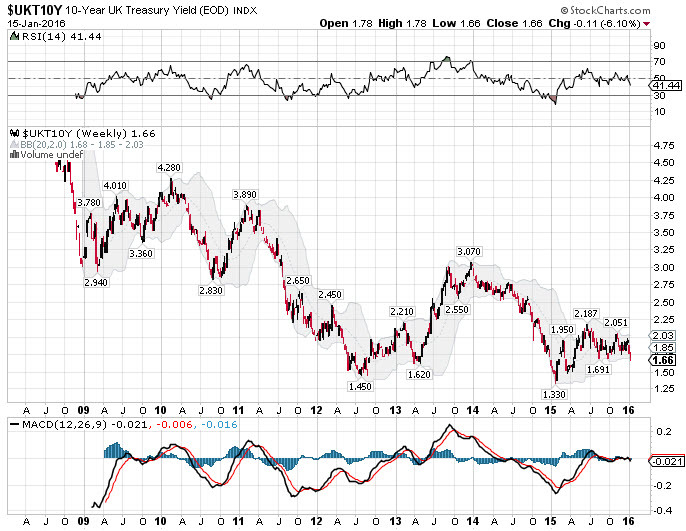 Japanese 10-year bond yields have fully retraced their 2015 move, while UK and US 10-year government bond yields have also started trending lower again. If stock market weakness persists over the next couple of months, pressure will come on central banks to restart quantitative easing (printing money, buying bonds) and government bond markets may now be discounting this increasing probability. High yield bonds continue to fall and are now -14% off their 2014 highs. Last year's divergence relative to equities provided a timely warning for investors that the market's risk profile was changing. Default rates across high yield bonds should spike before this move lower is done and we are not there yet. I expect more pain to come for high yield fixed income investors. For more information on my bond market analysis, please get in touch. You can reach me at brian.delaney@secureinvest.ie or 086 821 5911. Gold in euros returned -0.8% in 2015. A mix of bearish sentiment and apathy continues to surround the sector. The stage is set for the gold bull market to return and there are many positive catalysts, but at the moment, Nobody Cares (This light-hearted presentation by Grant Williams, saved in the Research section of our website, does a very good job of outlining the bullish case for gold and is well worth 28 minutes of your time). I am expecting a trend change in 2016. In his presentation, Williams refers to the Q3 2015 World Gold Council report on demand trends in the sector. The report highlighted a +27% increase year/year in overall investment demand for gold in the third quarter of 2015, a +33% increase year/year in bar and coin demand and a +62% year/year increase in consumer demand for gold in the United States in the same period. These are very significant numbers and if this trend continues, it won't take long for the bull market in precious metals to return. The +33% year/year increase in gold bar and coin demand is shown on a regional basis in the next table. China and the United States stepped up their purchases significantly in Q3 2015. Physical bullion ETF's lost additional ounces (-4%) in 3Q 2015 but the trend has slowed significantly since the start of last year. Once investors start accumulating ounces in the main gold ETF's once again, the gold bear market will have finally ended. I am monitoring this situation closely. For more information on our gold market analysis, please contact Brian Delaney at 086 821 5911 or brian.delaney@secureinvest.ie.